Two men sitting in King’s Square. Photo by Tony Cole, as are all the photos on this page. You can find more of Tony’s photos on flickr.com. But first, please stay awhile, here in King’s Square, before you go off and look. Take a pew. Wipe the pigeon poo off it first. Maybe sit on the Sound Effect bench or Paul Woosey’s bench. Or that iron one around the mulberry tree at the back there. Actually it’s not very nice here at the moment as there’s fencing round most of it and half the paving has been lifted. But let’s pretend it’s still like it was when this photo was taken. Quiet, sunlit, a bit scruffy. I’m going to tell you a story. Kind of. Or maybe several. The photo above, like all of Tony’s photos, is an aesthetically pleasing image. Why? Many reasons. There’s a story in it. There are many stories in it, but we don’t know what these two men are thinking so we’ll just have to guess. And maybe we’ll imagine more stories and more thoughts because these men are old enough to have seen it all. Their faces say that they have. Between them, not only space, but a tree, an aesthetically displeasing tree. It has been decreed that this is the case. Or rather, not the tree itself but the raised planter with railings it was placed in. In its unfashionable container, with its growing trunk wrapped in aesthetically displeasing and apparently forgotten Christmas lights, it unfurls its stupidly hopeful leaves every year, regardless, forming the rings in its trunk, and shading the hopeful and the hopeless. It didn’t get much time to grow in, just twelve years. Another of Tony’s photos. 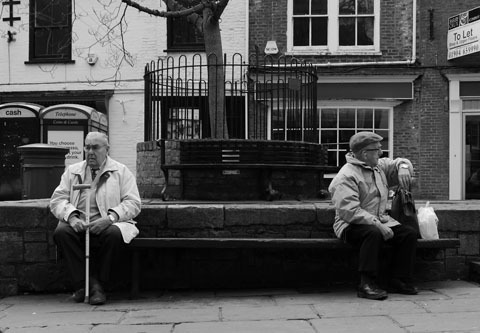 Same benches, in King’s Square, a different time, a different day. This is perhaps more aesthetically pleasing as the brick planter of the aesthetically displeasing tree isn’t so visible. 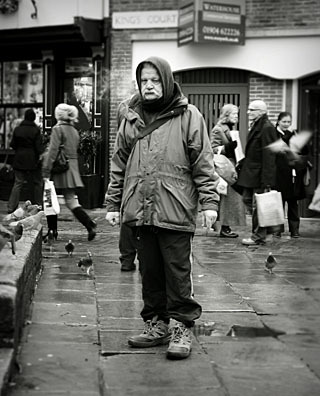 On the other hand, there are pigeons, and people eating, and all that ordinary everyday King’s Square life going on. Really I’d just like to ask, or rather, ask the question rhetorically: whose ‘aesthetic sense’ is driving the project known as Reinvigorate York, which is remodelling this place. I’ve been thinking about, reading about, the original vision, the vision derived from it. I’ve been thinking about, reading about, its consequences in the destruction or disregarding of detail. The dominant view, the dominant aesthetic, is predominantly that of the men with the power and the people who know the right people. Same as it ever was. I should have looked properly earlier. We all should have. I feel bad that I didn’t. But it wouldn’t have made any difference anyway, unless a load of us had looked properly and appreciated the details and said we did and gone to the meetings and been there from the start, and unless we were people with power and the potential to invest in businesses here, and most of us weren’t. So instead some of us are protesting late in the day on particular aspects of this ‘vision’. The particular aesthetic here in King’s Square, being removed, is a 20th century one, partly a late 20th century one, with some important details (the tree, and Paul Woosey’s bench) from the 21st century, very recent. It’s all a bit quirky and personal and haphazard in places, and happened organically and naturally because the people who lived here began to use this space where a church used to be. And over time we didn’t even think about the church because none of us remembered it, but we kind of noticed the gravestones on the raised bit but it was just one of those weird quirky York things like we had all over the place. We just liked sitting here. Spontaneous things happened. Or we just sat here and ate chips. It wasn’t trying to be a ‘world class space’, it just was what it was, a corner of York. There’s an important aesthetic being erased in this place by Reinvigorate York. The same will happen in other places, but it’s here that it matters most. It’s taken me months of looking and reading and taking photographs, every now and then, but I get the big picture now. I think I got it back last summer in ‘This land is our land‘, and in photos of a large vehicle parked in the middle of the square most evenings, like a tank occupying claimed territory, outside the visitor attraction. A lot goes on in King’s Square. Tony took photos. I sat on the benches at dusk and after dark and thought about what I wanted to write for these pages. I tried out all the benches during my occasional evening visits and they were all more comfortable than the new standard design around the corner near St Sampson’s Church. But that’s just because of my height I guess. We’re all different. But we all have to adapt to the new aesthetic: ‘Reinvigorate York’. It’s the vision of a particular group with a particular vision. Its vision is to turn all that is unique, small and special into a ‘world class space’, which could be anywhere in the world but here. I don’t ‘fear change’, which is the usual patronising comment aimed at people who question the wisdom of particular changes. I feel concern that York is losing its particular and special character. I know that it is. The dominant aesthetic doesn’t care about ordinary people and their contribution and their small markers. It doesn’t care about recent history. I’ve lived here all my life and seen many changes. Historical knowledge and understanding puts them in perspective. Thinking a lot and looking properly makes it even clearer. The local authority’s big ideas for improvement, though well-meant, have often been misguided and destructive. They still are. Imposing some kind of aesthetic vision on a place like York, all small scale and ancient and quirky, just destroys the spirit of place. Too many lives here now, too many people who care and have made their mark. All those small marks mean more than this expensive vision, this new aesthetic. Which cuts down trees and rips up paving and doesn’t notice commemorative markers. Not my idea of improvement. Is it yours? Thankyou for expressing so eloquently your thoughts, which chime so well with my own. I’m still struggling to come to terms with a council, and in particular a council leader who has made his personal opinion on those ’70s cobbles’ so clear, who can disregard the wishes of English Heritage completely. This, couple with numerous ‘#yorkheritage’ tags, displays, in my eyes, a hubris which i cannot begin to comprehend. Kings Square *is* the square, it’s not the buildings around it, far from it in my eyes, they only frame the square. While the new square will be clean, flat and unoffensive, it could be anywhere, Leeds, Birmingham, Portsmouth, wherever. We have lost something unique to York. No, not my idea of improvement. Beautifully expressed and right on target. Thank you.